Ok - Samta might look somewhat slimmer than all those Xmas pikkies suggest & I haven't seen him in his red outfit & cap but he still delivers..! Thanks Sam, you're the Ace of Spades!!! ...John's images here on CN displayed the very nice appearance of these units, but holding one in my hands certainly confirms there manufacturing build quality - now to test their optical capabilities in the hands of this complete newbie..! Fortunately I had all the where-alls to construct what I hope is a satisfactory assemblage...I could do with a very short spacer ring with a male T-thread on the outside...I do have one but I cut this on a lathe along with another one that accepts the TeleVue 2X barlow lens element...this meant that there are some "pecadilloes" to the thread & on some fittings/adaptors they don't work..! Both screw into the ZWO ADC's female T-threads but NOT into the Nautilus EFW's female T-threads....! Really looking forward to the next imaging opportunity - we only just got back from 2 days up North at Ororroo (a 900km round trip) but the seeing was rotten - "chasing the seeing" isn't all fun & games tbh..! 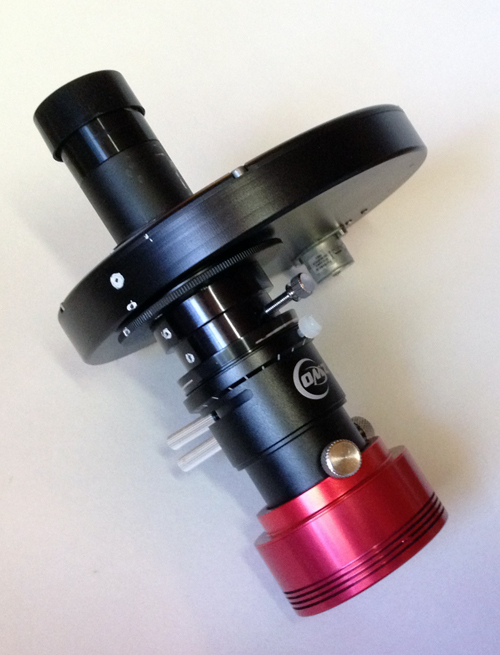 Here's a couple of piks of how the unit will look if we head off again before we get that male T-thread spacer...in this configuration we have 64mm distance between barlow element & camera sensor - there is normally 76mm separation from element to the top lip of the TV 2X barlow so we should get a bit less that 2X...probably around f20 which I'd be more comfortable at than the current f22+ we employ without the ADC on the ASI224MC - so that's an added bonus! DISREGARD THE "ASI174MM" ON THE CAMERA - THIS IS A "BETA" ASI224MC IN A 174 MONO BODY..! - also, only phone piks...my camera's card-reader is stuffed! Still waiting for our ADC to arrive here; hoping it gets here soon (not that it matters of course, it will be cloudy anyways). Also, what's the secret to using it with that mono camera of yours? Edited by AstroEthan, 30 December 2015 - 11:15 PM. Mars and Saturn will be especially low in the sky for us this year, and Jupiter is steadily declining as well. This will definitely be a big improvement for those two. 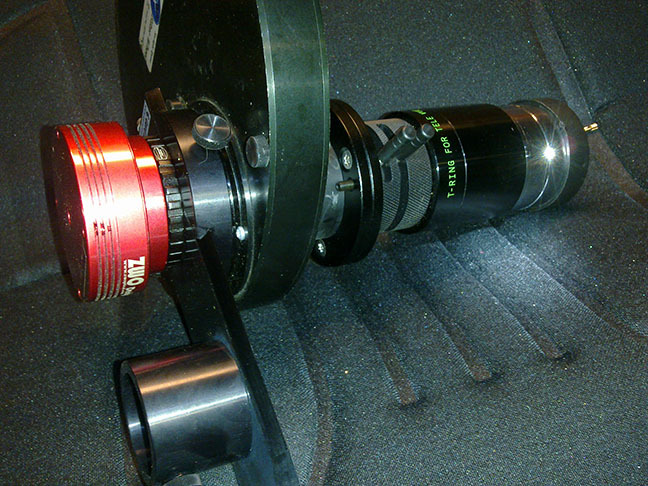 I'll also be able to make use of this for double star imaging. Hope this is fairly self-explanatory..! ...this isn't an online order Gusztav, Samta sent me this for Xmas! However, I have every reason to believe people who have ordered them will be receiving their ADC's very soon, if indeed they are not receiving them already! On another note I could still position the 2X barlow element in front of the EFW (ie, the scope side) & keep the f/l in check...I miscalculated for my earlier comments above but it would be "touch & go" re image scale & I'll go with the arrangement shown above...as I understand it the advantages are for better dispersion correction with more distance between ADC & camera sensor - & the arrangement shown above will provide this far better than with the barlow element on the scope side of the EFW. Wow that's quick! I read 3-4 weeks! Good info Darryl look forward to seeing your first results. I hope I'm correct about the imminent delivery for customers Stuart - but I'm sure they'll come pretty soon, regardless. If they weren't so contrary I'd have everything I need to screw-fit all the components together right now..! We hope to cut our teeth (pardon extending the pun! ) on the use of the ADC as soon as the weather gives us an opportunity..! Sam posted in his forum that the pre orders have overwhelmed his current supply and he expects to start delivery by mid January. I'm okay with the wait. I still have only had about 4 crummy nights with my new ASI224, so I'm still learning how to use it. Need to nail down my workflow before introducing another element into the system. ...if the weather continues the way it is, we'll be lucky to image before then with the new ADC anyway Paul..! Where in the ZWO forum did you find that? I wonder why ZWO can't send information about delivery times and delays to the persons that have ordered and paid. Strange that this information is only to be found on the Yahoo forum. Edited by ZielkeNightsky, 01 January 2016 - 11:54 AM. Very interesting indeed. I have been using Pierro Astro ADC for almost two years now and am currently running the MKII version. For me ADC is a must because here in northern 61st latitude all the objects tend to be low in the sky... I have been very happy with the ADC and it has improved my results. I think what I have "extra" in my setup are those tilting adjuster and guiding excenter. Those I need because ADC tilts the light path and thus optical axis also away from the center. And in my SW400p dob the coma free area is very small. So I use those to adjust the camera to follow the deflected optical axis. Otherwise the coma free zone would even miss completely the camera sensor when imaging low hanging objects. I have been using ASI174MM and ASI224MC. 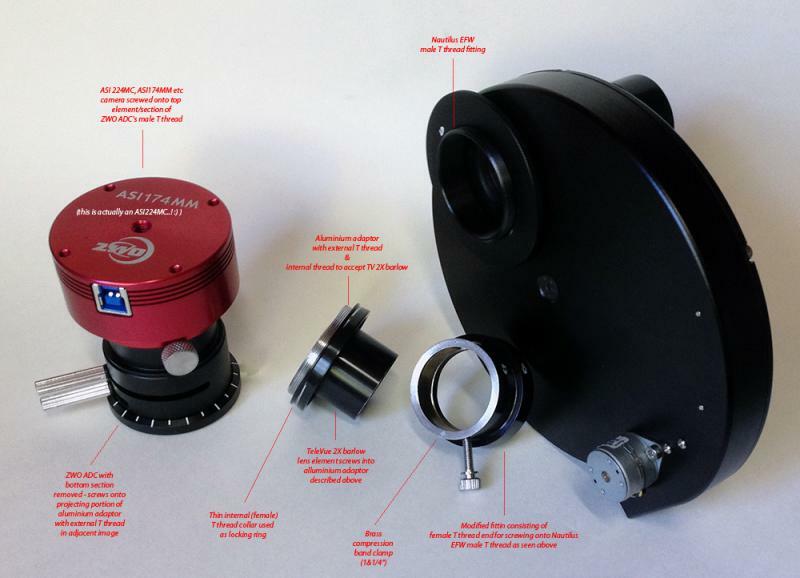 But now I ordered the new ASI178MM camera with very small pixels (2,4um) for imaging the moon. It is appealing me to be able to image large areas at once while still using highest possible scale. What bothers me with the ADC is that the nearest fit for the optimum scale I can now get, is with the 2,5x powermate that will be running around 2,2...2,3x in my train. That will lead to just and just F10 which is at the low limit of the ADC F ratio spec without causing astigmatism... If the future goes towards smaller pixels and faster F-rates, that could cause problems using ADC:s with large Newtons. Lets see once I get the ASI178MM and get to test what happens. 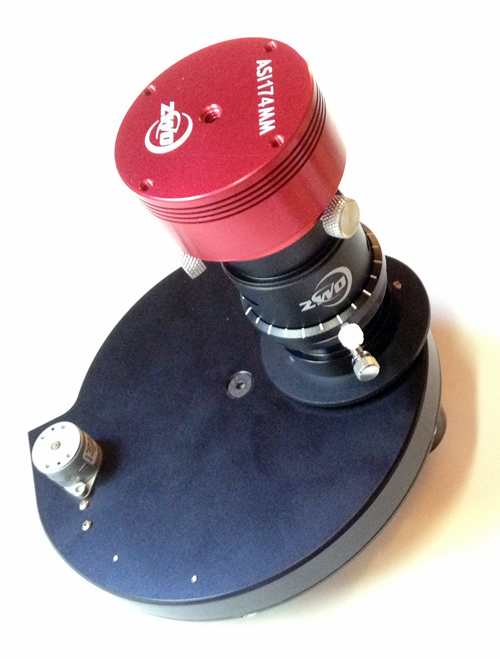 I've been thinking about the image shift problem as I use an f3.3 newtonian. I could try imaging through my Paracorr 2 but I'm not sure what that would do to the image quality but it works great on planets at very high mag visually. Or I could make a tilt or platform adjuster of some sort. RAC, how do you plan to bring the f ratio up to where the ADC likes it? Are you going to use a 5x barlow or something like that? Yes a 5 x powermate with a t adaptor is what im currently using, this gives me f16. Very interesting Ari - I had no idea that the coma-free area would be so small as to affect your image...& on that same matter, I had no appreciation of how much deflection there would be of the image - I understand the Gutekunst unit negates this image-shift situation but I'll have to re-read all the ADC info...from what I read, Martin Lewis thought that the image displacement away from the optical axis was more an inconvenience, easily accommodated, without commenting about affecting optical performance...whilst I see that John makes a comment about astigmatism - is the aberration you refer to astigmatism or coma...as I believe they can be confused...& is this effect more an issue at much lower elevations..? I looked at Gerd's double-unit some time ago for switching between parfocal cameras of same-pixel sizing for using together in rgb & luminance roles, as well as for an ADC amongst other things...from communicating with him he makes some high-quality accessories - but I never like parts with only thumbscrews without compression band clamps...although you can use screwed T thread connectors in lieu of these thumbscrews: I also felt "slider stops" would be better for the other use I was entertaining...are you using this to re-locate the planet in the centre of the fov via an eyepiece with the other barrel, using this device to "hunt down" the image due to the enormous shifts you experience...or is the slider/guiding excenter merely for adjusting the ADC with a parfocal ep..?!? Each optical system is different but I'm surprised by how much you're finding that the deviation is wrt coma-free fields, reading your post - obviously I'll have to go into this a bit further...or rather, I'd like to hear more from yourself & others using these ADC's on these matters! ps: your tilt adjuster...what role & sequence is this employed in, wrt collimation..? Edited by Kokatha man, 02 January 2016 - 10:47 PM. f/4 Newtonians have very strong coma, and even f/5 will require coma correctors for relatively small DS cameras. For planets placed in the centre it isn't that much of a problem. (unless it's some extreme design). This will be an interesting problem that I'm sure I will have to deal with. is the aberration you refer to astigmatism or coma...as I believe they can be confused...& is this effect more an issue at much lower elevations..? Astigmatism: This is now a possible problem when I am planning to image the moon with ASI178MM with small pixels. That is forcing me to use F-ratio around 10. ADC might cause astigmatism when using faster F-ratios. That is not a problem with planets again where I am using ASI174MM or 224MC and F ratios F18...F30. I use the excenter only to supplement the adjustments done by the tilt adjuster. I adjust basic tilt for elevation area, say 25-45 deg and then finetune with the excenter as needed. I collimate the scope without the imaging train separately and then the train separately. I point laser collimator through the train (without barlow and camera) and adjust the laser spot dead center of the camera connection outlet of the excenter with a certain elevation adjustment done to the ADC. These adjustments are not changing through time and they do not need to be so exact, because the error is so small already from the beginning. 2 degrees of tilt adjustments and 2mm additional excenter slide and thats it for the Jupiter or moon in 34 deg elevation. When moon reaches 45 deg I just put the excenter slider back to 0. The effect is propably zero with planets and very small with the moon, but I like to compensate for every error I can. That might matter on those two nights of good seeing I yearly have. And because most of my imaging is done around 30...40 deg object elevation. Thanks for your insights Darryl, I just ordered mine from ZWO and look forward to testing it soon with the recently acquired ASI224mc. Happy New Year! I am impressed with your technique under challenging circumstances! Very well done sir. I dont have a good number for the astigmatism induced by a f/10 light cone. It will have much less of an impact than one would have without a dispersion corrector at low elevations. You can judge the level by using a startest, it will be viewable. Of course you could bin the small pixels by 2X and use f/20 to control it as well.